Do you remember the evil machinations of the duplicate content monster from last week? 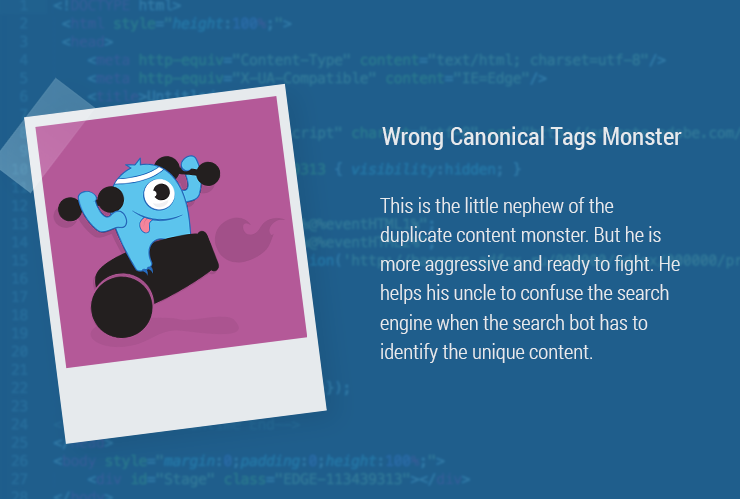 Today we’re talking about its helper: the bad canonical tag monster. Duplicate content is a problem that every webmaster will have to confront at some point. Identical and similar content on different URLs can create confusion and thus lead to ranking problems. Last week, we suggested the canonical tag as an effective solution for the duplicate content monster. But it is precisely here that today’s pest feels most at home, because in using these tags, a lot of errors can creep in. We will show you how to quickly tame this troublemaker! Pages can be called up with or without trailing slashes (“/”) or with lower or upper case spelling (Case sensitivity). The server only pays attention to one ID when the URL is rewritten, that is, it allows variations on the address. IDs (such as Session-ID or product filter) that don’t change the content are used. There are https variations of the pages. Content is also being published on other external websites. Basically, it makes sense to build the canonical tag into every sub-page, so that every page references itself. Hereby, unexpected errors and false links can be avoided. The canonical tag is nevertheless a powerful tool and shouldn’t be underestimated. If used incorrectly, websites may be completely ignored by Google. So you should now ask yourself if the content is really identical or nearly-identical. Canonical tags only make sense if it is. In the following practical examples, the canonical monster has messed up the work, so pay attention! If you have an online shop, you should really think about whether or not you want to use canonical tags. If you work, for example, with pagination (number pages) and thus use the attribute rel=”next”, rel=”prev”, it doesn’t make much sense to use canonical tags since the content isn’t really identical. When using canonical tags, you should be sure that the canonical URL is valid and reachable. A 404-error message is a sign that a bad canonical monster is wreaking havoc on your page. The canonical tag is a powerful tool that you can use to bring problem pages into the Google index – you should definitely avoid doing this! Correct the URL in the canonical tag and send this monster packing. Today’s monster also likes to misplace the canonical tag in a document’s body. But it hasn’t gone missing there and should not be used more than once in the meta data. You will find the canonical tag analysis in the module Website Success under “Indexability” > “Canonicals” > “Usage”. When optimizing, pay special attention to the speedometer reading “Not placed.” It will show you all documents that do not have a canonical tag. If a canonical tag redirects to a 404-error message, you will see this quickly with the help of Ryte. You will find this report in the module Website Success under “Indexability” > “Canonicals” > “Status Codes”. With one click on the graphic of the 404 status codes, you can set a filter, and only the canonical goals with a 4xx status will be displayed. Together, the duplicate content monster and the bad canonical monster can create a lot of havoc on your website. But if you take our tips in these two articles to heart, you’ll keep both these monsters in check. Published on 06/07/2017 by Eva Wagner.